Harbor Graphics is a supporter of the summer Washington Business Week programs. These unique programs put students in the action seat. A volunteer mentor from the business community works with a small group of 8-12 students as their guide. As a team they learn about business, have a blast, and compete in a simulated business challenge for major bragging rights. All of the programs are designed to engage teens in hands-on, experiential learning. 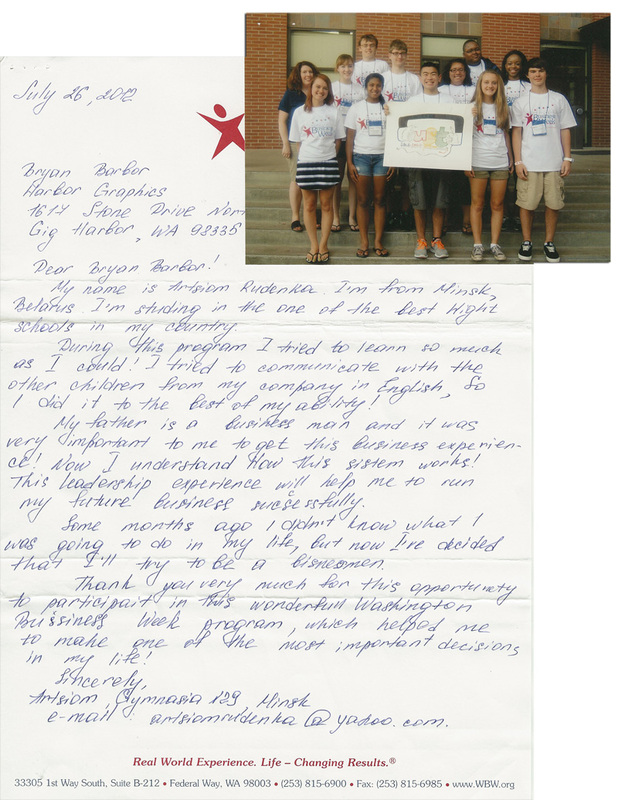 Here are some letters of appreciation written by the high school students that Harbor Graphics sponsored for one of the summer Business Week programs. Visit www.wbw.org to see the kids and volunteers in action or to find out how you can get involved next year! 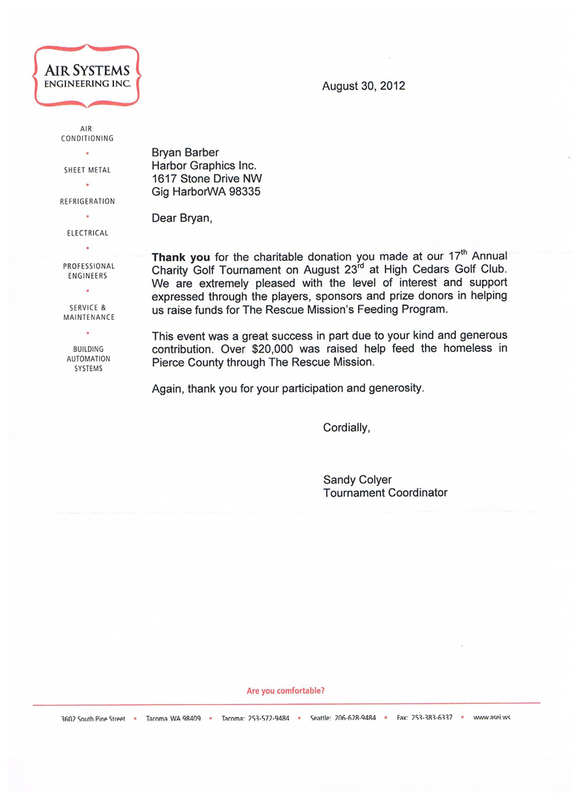 Harbor Graphics received a letter of appreciation for their charitable donation made at the 17th Annual Charity Golf Tournament on August 23rd at High Cedars Golf Club. Over $20,000 was raised to help feed the homeless in Pierce County through The Rescue Mission. Thank you SO much for completing my rush order the other week. You guys were the only screen-printers that would even listen to my order since is was so small (I called about 4-5 other screen-printers before I finally called you). The order came out PERFECT and myself and the recipient were very happy. I will refer any screen-printing/embroidery work to you from now on. Thanks again! I want to thank Bryan for the great job that he provided me and my brothers for the Washington Masters 25th anniversary golf tournament. When I met with Bryan he was easy and great to work with. He sat me down and went through his products and showed me what different types of embroidery would do to different fabric. 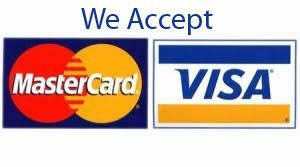 It was a very informative appointment and we ended up with a great product. In total my order was 62 garments with 4 different types of shirts and numerous sizes to boot; this was no small task. During the transaction Bryan and his staff were there to help at a drop of a hat. Not only was the order done on time, it was perfect. On behalf of my family and the Washington Masters participants: Thank You Harbor Graphics and Bryan Barber! This was a very positive experience despite the fact that during this time Bryan lost his father. And when Bryan was not available due to this loss, his great staff was AWESOME and a pleasure to work with. Thank You Harbor Graphics for making the 25th anniversary of the Washington Masters a HUGE success.